The floor is one of the biggest areas of your home which needs to be cleaned more regularly. Cleaning tile floors can be a pain in the neck especially if you happen to have a large floor covered with different types of tiles. Homes with high foot traffics (number of people getting in and out of your home) usually has their tile floors invariably invaded with soil, sand, grit and dust particles. While their presence may turn to be less significant, these particles are more likely to scratch, erode and otherwise damage your tile floor and the outer finish. 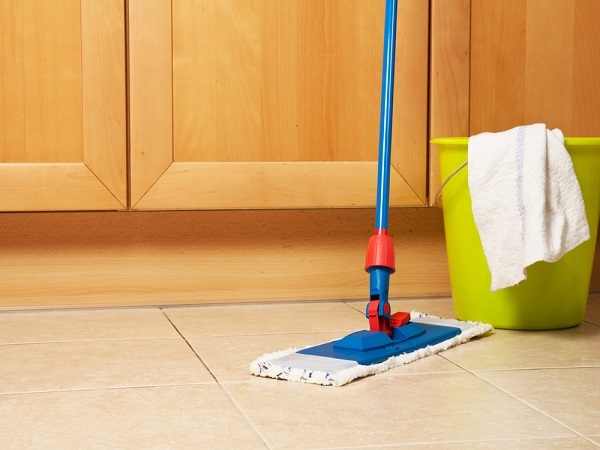 Some people rely on the old fashioned methods of cleaning tile floors with a simple broom, mop and bucket while others prefer wiping out spills immediately they happen or placing mats on the door steps to trap dirt. For those who prefer using machines and other complex cleaning materials, this article will guide you on which cleaning machines to consider. Available in a variety of shapes and sizes, jet cleaners operate through releasing high-powered water directly on the surface underneath. This machine is designed with a series of high-power jets which are hosted on the head of the machine alongside a build-in vacuum which helps to dry excess water from spreading across your floor. Jet cleaners are perfect for cleaning tile floors, removing grout, hard stains and dirt from your tile floor areas. A buffing machine is a large upright machine held with two hands and used to clean tile floors with a lot of dust and debris build-up. This machine is preferably used alongside another household cleaner as it leaves a lot of water littered on your floor. The best part about it is that it vigorously scrubs your tile floor to remove any grouts, dust, stain and dirt particles leaving your floor spotlessly clean. Quite similar to jet cleaners, steam cleaners take advantage of their pressurized steam to remove grouts, dirt and debris. Known to be gentle and very soft during operation, steam cleaners are highly reliable in cleaning granite and marble tile floors since they don’t scab or pressure your floors. 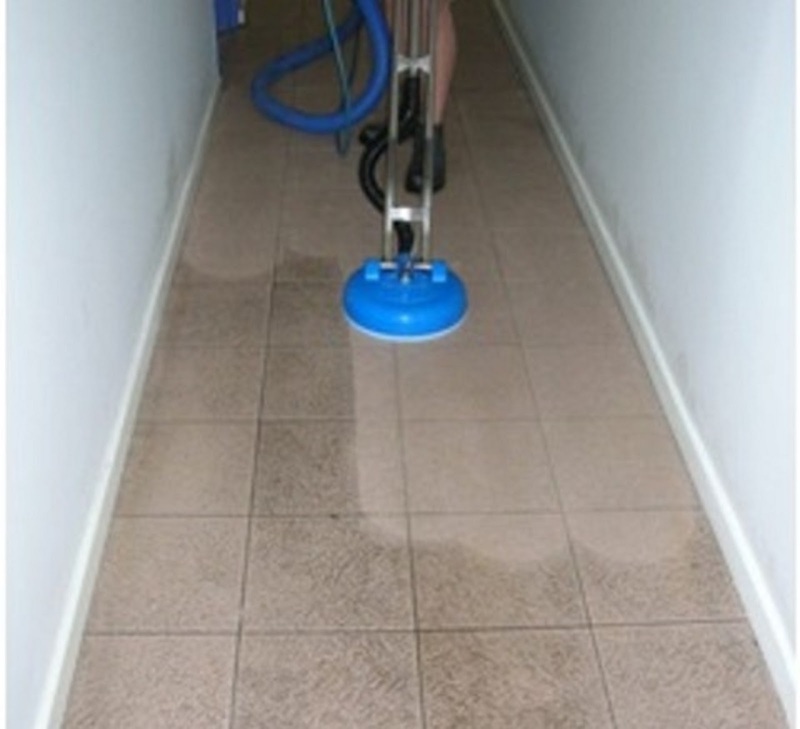 An auto scrubber is another ideal alternative which one can use to clean tile floors. Before you start the cleaning process, it’s advisable that you first sweep your tile floor to remove excess debris and dirt particles. This reduces the chances of your machine from grinding tiny particles on your floor which can damage your floor finish. When operating, scrubbers usually perform an in-depth scrubbing of your tile floor while mopping and vacuuming simultaneously. Vacuum cleanersA vacuum cleaner is another perfect product which one can use to clean tile floors. Note that, there are different types of vacuum cleaners which are designed to clean different types of floor surfaces. Most people usually mistake vacuum cleaners whereby they purchase bristled vacuums designed to clean carpets and remove pet hair instead of those designed to clean tile floors. Since these vacuum cleaners are designed to vigorously scrub carpets, they end up scratching your tile floor leaving it horribly untidy. To tackle this problem, you’re required to research on the best tile floor vacuums which are designed to double clean your floor leaving it spotlessly clean for hours. Among the vacuum cleaners for tile floors include; Dyson DC25 Ball, BISSELL PowerEdge 81L2A and Eureka 3670G Mighty Mite. ConclusionI agree with you that the cleaning solution you select highly depends with the type of tile floor you have in your home. Whether your floor requires a simple or a stronger cleaning solution, all these cleaning machines will ensure that the job is done fast and easy. Whether your floor is made of ceramic tile, stone tile or vinyl tile, all the above cleaning solutions are there to help you achieve great results with ease.